She is a complete vagabond and has a style of her own. Always in her trademark pyjamas and long loose t-shirts, 19-year-old Jasleen Royal from Ludhiana is a rock star in the making. Looking at the petite Jasleen, no one can imagine how talented this she is. But the moment she puts the guitar around her neck and starts strumming those strings while playing a mouth organ along and lending her voice to a beautiful song, one can be nothing but astounded. Finalist of India’s Got Talent, Jasleen is a multi-talented performer. She plays the guitar and mouth organ simultaneously and concurrently sings song beautifully. The chemistry of mouth organ and guitar are her USP. 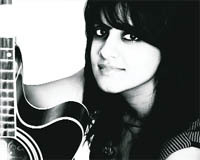 With no formal training, Jasleen Royal learnt music on her own. When she first entered for the auditions of the show, nobody ever expected this girl dressed up casually in her shorts and chappals will win the hearts of judges in her very first attempt. Sharing the initial hiccup, she got for her style, she said, "Many watched me curiously, some thought I was not serious about the show and just walked in. But soon, everybody became acquainted with my style. Even on stage, I use to perform in my pyjamas or shorts with slip-ons. Later on, my gypsy style became my special trait," she adds. Always inclined towards music, she taught music to children almost her age when she was just 14. "Because I wanted to be independent and financially self-reliant. Although nobody in my family has a background in music but they always stood by my decisions" she beams with confidence. Beginning with the keyboard, she learnt guitar and mouth organ herself. Now she can play these two things at the same time. An alumnus of Sacred Heart Convent School, she learnt keyboard from her teacher Dhiraj. Then it was the strings of the guitar that fascinated her and she took up to learning guitar. "It is with constant practice that I am bale to handle the guitar and mouth organ together" she smiles. Pursuing B.Com (Hons) at Hindu College, Delhi, Jasleen is like any other collegiate-random yet certain, humorous and appealing. Showcasing her talent on national television was a huge opportunity for her.`A0Jasleen rates herself as an amateur but she is confident of her talent.`A0She wants to make music to promote peace and love. Jasleen, who is a writer, composer and singer says, "I want to become a successful performer". She has performed in enumerable college fests and shows. She was selected a youth icon by IIT Roorkee and is also judging Lucknow auditions for Zee Aspire Music to Money Challenge on Zee Business. Next in her kitty is an album and she has put her fingers crossed till the release of her debut album. "My album is my baby and I have put all the hard work into it. All the songs are written, composed and sung by me. Songs in the album explain my varied experiences of life," she quips. Songs revolve around the basics of life and the simplicity with which she expresses emotions through her songs has always been commendable. No stopping this rockstar from rocking the world of music and entertainment.